The Lily Pad Toss Kids Pool Toy - Melissa & Doug is a fun toy set that challenges young swimmers to toss six of the included colorful frogs onto three plastic lily pads. These kids pool toys are color coordinated, numbered, and sized to sort and score, or you can explore the many variations offered. These Melissa & Doug toys are sure to liven up a day at the swimming pool. These Melissa and Doug pool toys are intended for ages 4+ and require adult supervision. 1. 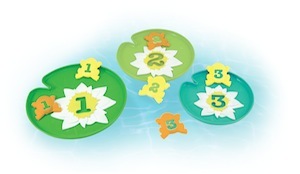 Place the plastic lily pads carefully into the pool so they float on the surface. 2. Without getting too close to the lily pads (try to maintain a consistent distance), toss the #1 frogs at the #1 lily pad, the #2 frogs at the #2 lily pad and the #3 frogs at the #3 lily pad. 3. When a frog lands on top of the tray and doesn't fall off, you get a point. Add up the total number of frogs that landed to get your score. Extra challenge: For added difficulty, only award a point if the frog lands correctly on the lily pad (on all fours).